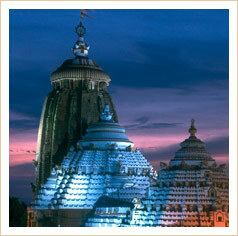 Puri, the abode of Lord Jagannath is one of the four Dhams, celebrated religious centers of India. It was once a thickly wooded hill inhabited by the Sabaras (Pre-Aryan and Pre-Dravidian tribes of the Austric linguistic family). The sunny beach at Puri is one of the finest in the world. Watching the sunrise in spectrum of colours is a wonderful experience. It is one of the most popular sea-side resorts where visitors from any part of the globe can comfortably relax. For centuries now, the beach at Puri has been the venue of countless pilgrims taking the traditional purifying dip. However, for decades now, both Indian and foreign beach lovers have made it their special haunt. The fine golden sands of Puri beach and the roar of the breakers rolling in from the Bay of Bengal have fascinated visitors throughout the ages. As it is with all the beaches of Odisha, overcrowding is never a problem and the sight of holiday-makers having entire stretch of the beach to them selves is not uncommon. The local fishermen, with their catamarans and wide brimmed cane hats are welcomed by tourists.They are not only providing you with a ride on their boats but also act as lifeguards if you wish. And yes,they are also expert masseurs. With excellent beach facing hotels and guest houses, the Puri beach is an ideal holiday spot where you can easily spend a lot of time and relax. The Temple of Lord Jagannath built during the 12th century A.D. by Chodaganga Deva dominates the landscape for kilometers around. Being the tallest temple (65 metres) in Odisha, it is one of the most magnificent monuments of India. In front of the main gate stands a 16 sided monolithic pillar (11 metres high), called Aruna Stambha which stood in front of the Sun Temple and was brought to Puri during the 18th century A.D. Some of the other important temples are Gundicha, Lokanath, Sunara Gauranga, Daria Mahabir and Tota Gopinath. Best time to visit Puri - the year. Best time to visit Puri - Round the year. By Air : The nearest Airport is Bhubaneshwar (60 kms). By Rail : Puri is a Railway terminus. 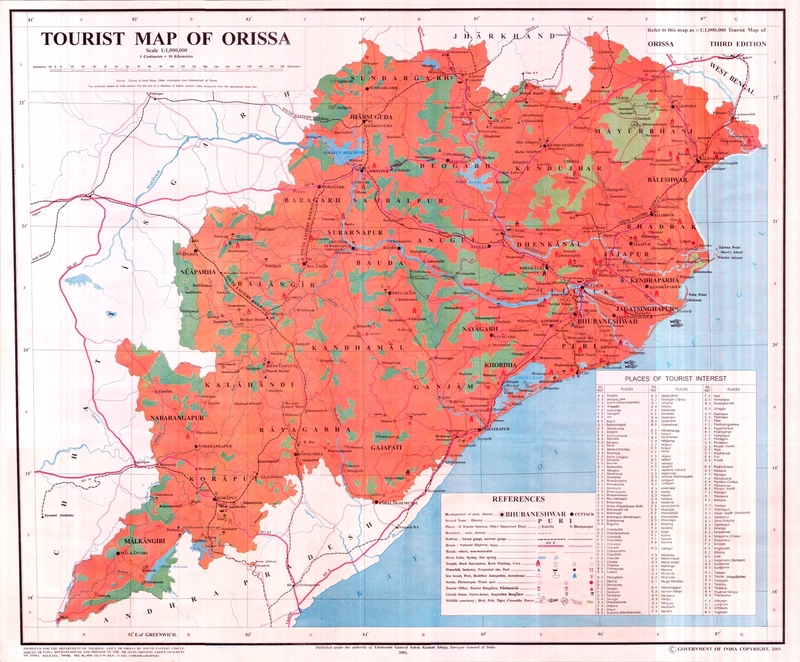 By Road : 60 kms from Bhubaneswar and 35 kms from Konark, it is connected by NH 203. Regular bus services, both private and public sectors operate to and from various places of the State and adjoining states. Very frequent bus services are available from Konark, Bhubaneswar and Cuttack. Internal Transport: Taxies, Auto Rickshaws, Town Buses and Cycle Rickshaws. Comfortable and economical accommodation can be availed at Puri (STD code-06752). Hotel Sea Wave, C.T.Road, Puri, Tel.-223226/227226 Shantiniketan Lodge, Gourbar Sahi, Puri. Sun Row Cottage, C.T.Road, Puri, Ph.- 223259 Hotel Atithi, Swargadwar, Puri. Comfortable and economical accommodation arrangements can be availed at Puri (STD code-06752). Hotel Leo Castle, C.T.Road, Puri, Ph.-227645 / 224624 Hotel Neelambu, C.T.Road, Puri. Town Lodge, Temple Road, Puri. Satyashree Lodge, Grand Road, Puri. Hotel Jyoti, Grand Road, Puri, Ph.- 223269 Bhawani Lodge, Grand Road, Puri. Pulin Kutir Lodge, Sea Beach, Puri. Happy Home Lodge, Gopal Ballav Road, Puri. Sagar Lodge, Swargadwar, Puri. Jagannath Lodging, Grand Road, Puri. Ray Lodge, C.T.Road, Puri. Hotel Nandy Cottage, C.T.Road, Puri. Lodge Bishnu Bhawan, West Gate, Puri, Ph- 230487/437 Maruti Lodge, C.T.Road, Puri. Star Lodge, C.T.Road, Puri, Ph.- 227245 Sudarshan Guest House, Swargadwar Road, Puri. Hotel Holiday Club, C.T.Road, Puri. The Ocean Pearl, C.T.Road, Puri. Purusottam Lodge, Gopal Ballav Road, Puri. Hotel Sweet Home, C.T.Road, Puri. Mahaprabhu Guest Ghouse, Swargadwar, Puri. Hotel Dial-Ring, C.T.Road, Puri. Sri Balaji Lodge, Dolamandap Sahi, Puri. Hotel Sand Piper, C.T.Road, Puri. Bideshi Ghar Lodge, Swargadwar, Puri. Aram Niwas Lodge, Grand Road, Puri. Binu Guest House, (Sagar Associates) Gourbar Sahi, Puri, Ph.- 231389 Sharma Lodge, Grand Road, Puri. Sagar Saikat-II, (Monali) C.T.Road, Puri, Ph.- 223253 Panthabhawan, OTDC, Sea Beach, Puri. Gochhikar House, Swargadwar, Puri. Ph.- 231064 Hotel Bhudevi, Near Bharat Sevasramsangha Library, Swargadwar, Puri. Hotel Vinayak, Gourbar Sahi, Puri. Ph.- 230820 Hotel Subhasomaya, Gourbad Sahi, Puri. Govinda Dham Lodge, Gourbad Sahi, Puri. Nirla Lodge, Swargadwar, Puri. Jagannath Villa, Gopalballav Road, Sea Beach Puri. Rainbow Guest House, Digunta Lane,Swargadwar,Puri. Nabadurgalaya Guest House, Backside of Aurobinda Sahi,Puri. Hotel Sankhabela, Goudabari Sahi, Baliapanda Sea Beach,Puri. Puri offers a plethora of picturesque places for tourists, abounding in natural and architectural splendour for Excursion Tour. Brahmagiri is known for the living shrine of Alarnath. Streams of pilgrims visit Alarnath during Anabasara of Lord Jagannath. (the period of fifteen days when the deities are kept in isolation from public view after the Deva Snan Purnima, the Bathing Festival).Nearby is the shrine of Baliharachandi on the solitary sand dunes. 25 km to the south-west of Puri, near Brahmagiri is the temple of Baliharachandi. Situated on a sandy hill near the confluence of the river Bhargavi, Goddess Durga is worshipped here as Baliharachandi. The scenic beauty of this place is ideal for group picnic. One of the most famous artist village in Odisha, Raghurajpur boasts not only of the exquisite crafts ‘patachitra's and talapatrachitra, but also of being the native place of the world famous Odissi danseuse Guru Padmabibhusan Kelucharan Mohapatra,and Gotipua dance guru Padmasree Maguni Das . Even today, under the tutelage of renowned Guru here, young boys practise Gotipua dance which is the genesis of Odissi dance. A visit to Odisha would definitely be incomplete without a visit to this quaint little village. Satapada, is a retreat in nature on Chilika Lake. Its location near the confluence of the Lake and the Bay of Bengal, and proximity to Puri (50 km), makes it an ideal spot to enjoy the beauty of Chilika. The thrilling sight of dolphins round the year and abundance of migratory and resident birds in winter make it an ideal place for a vacation with nature. The Casuarinas fringed Balighai beach is a famous picnic spot. The sun and fun at the mouth of the river Nuanai is unforgettable. This sanctuary is situated at convenient location along the seacoast between Puri and Konark. The flora of the area includes casuarinas, anacardium, neem, tamarind, karanja, etc. The prominent fauna includes blackbucks, spotted deer, monkey, squirrels, jungle cats, hyena, jackals, mongoose and variety of birds and reptiles. The entry point of the sanctuary is located just 3 kms from Puri. Puri-Konark marine drive passes by it. Satyabadi or Sakshigopal is known for the shrine of Lord Sakshigopal. It is believed that the visit to Puri is incomplete without a visit to Sakshigopal. The place is only 20kms. from Puri and 2 kms from the main road leading to Bhubaneshwar and is convenient to visit. 7 kms from Satyabadi, Balunkeswar Pitha is famous for the Siva Shrine of Lord Barala Balunkeswar. Legend would have it that Lord Rama during his exile had installed this Siva Lingam in sand under a banyan tree. Baruni Yatra is the biggest festival observed here for two days . Regular bus service is available up to Patanaikia Chhak (3 kms) on NH-203 (Puri-Bhubaneswar road). Famous for the temple of Biswanath on the top of the hill located near Delanga-(2 kms).The nearest bus stop to reach the place is at Delanga Market. 17 kms from Satapada, the place is associated with the cult of Lord Jagannath. Legend would have it that Lord Jagannath and His brother Lord Balabhadra had taken sweet curd from the milk woman Manika on the way while proceeding for a war to win over Kanchi in South India. So the place is named as Manikpatna. The 13th Century Bhabakundleswar Siva temple is an added attraction of this place. 4 kms from Balighai it is an ideal Sea beach. Pipili is the center of colourful appliqué work.Applique in Odisha is an old temple art , which has been refined to perfection. A fine example of the craft is the enormous applique canopies which cover the chariots of the Trinity at Puri during Rath Yatra.. Applique art is the process of cutting coloured cloth into shapes of animals , birds, flowers, leaves and other decorative motifs and stitching them on to a piece of cloth that can ultimately be used as a lamp shade , a hand bag or even a garden umbrella . Many of the Applique Artists of this village have won national awards for their crafts. Bhubaneswar (60Kms.) and Konark (35 Kms.) can also be conveniently visited from Puri. Sri Jagannath, Gundicha, Sri Lokanath, Sunara Gauranga, Daria Mahabir, Tota Gopinath etc. Indradyumna, Manikarnika, Markanda, Narendra and Swetaganga are names of Puri's sacred tanks which offer a tranquil site for repose and relaxation for tourists. Bada Chhata Math, Bauli Math, Dashavatar Math, Jagannath Ballabha Math, Punjabi Math, Satalaharhi Math, Sri Chaitanya Goudiya Math, Sri Purushottama Goudiya Math, Sri Radhakanta Math, Sri Ramakrishna Math, Sri Shankarachrya Govardhan Math, Sri Saraswat Goudiya Math and Thakur Bari Math. Akhila Bhartiya Jayaguru Sampradya Ashram, Bharat Sevashram Sangha, Dhyana Mandir Ashram, Ramkrishna Mission Ashram, Sri Chaitanya Ashram and Girinar Banta Ashram. There's much more to Puri than its temples and beaches. Puri offers a plethora of colorful fairs and festivals round the year. However, the Ratha Yatra or Chariot Festival, Snana Yatra, Gosani Yatra, Puri Beach Festival, Shreekshetra Utsav, Ganesh Puja and Jhulana Yatra are among the more widely celebrated ones. Puri is a spectacular souvenirs centre. Seashell, Pattachitras and Palm Leaf paintings, Horn work, Wood carvings, and Solapith work can be purchased from Utkalika Emporium outlets or from the numerous private shops / stalls spread all over the beach town. Also, check out Puri's Swargadwar and Grand Road (Bada Danda) Market, Art & Craft complex at Mochisahi Chhak, Sudarshan Crafts Museum at Station Road, Sun Crafts at Police Line Square and Sambalpuri Bastralaya at Grand Road. Delectable seafood, traditional Odia Cuisine, Indian (veg and non-veg), Chinese and Continental cuisine are available in the restaurants and hotels at Puri. Khira is a local sweet milk preparation.